This past Saturday night was a big night in boxing, as Sergey “Krusher” Kovalev (31-2-1, 27 KO’s) showed the world that he is not yet done, when he decisively defeated Slava Shabranskyy (19-2, 16 KO’s) with a second round TKO victory. Yuriorkis Gamboa (28-2, 17 KO’s) also resurrected his career with a controversial split decision victory over Jason Sosa (20-3-4, 15 KO’s). Gamboa was seemingly way behind on the score cards, but somehow got the nod from the judges. The co-featured bout of the evening was a wild one. Sullivan Barrera (21-1, 14 KO’s) defeated Felix Valera (15-2, 13 KO’s) after the two fighters traded knockdowns in the first round. Valera was penalized 3 times for low blows, and ultimately lost on the cards by a huge margin after being thoroughly outboxed by Barrera. Barrera is now the mandatory contender for Dimitri Bivol’s Light Heavyweight title. So the question of the night was, which Sergey Kovalev would show up? 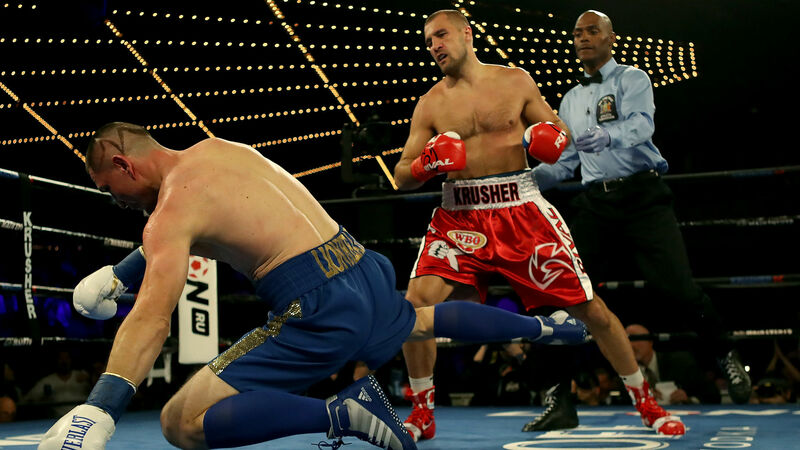 The Krusher, or that other guy that lost to Andre Ward twice? The answer was The Krusher. Right out of the gate you knew Kovalev was coming to rip someone head off, as he threw a huge right to start the fight. About halfway through the first round, Kovalev landed a big overhand right that put Shabranskyy on the canvas for the first time in the fight. Later in the first round, Kovalev landed a right cross/left hook nomination that really hurt Shabranskyy and put him down for the second time in the round. In the second round, Kovalev nailed Shabranskyy with another right hand that stunned him, and then finished him off with a combination. Pinned against the ropes and badly hurt was Shabranskyy, so referee Harvey Dock was forced to step in and stop the fight. Kovalev gets the TKO victory and regains his WBO Light Heavyweight title that he lost to the now retired Andre Ward. The final punch stats read as follows: Kovalev landed 50/113 punches (44%), while Shabranskyy landed a mere 16/71 (23%) punches. Before the fight, Kovalev admitted that he lost his way between the two Ward fights. He stopped training and stated drinking. He just wasn’t right. But he got himself back together, and it sure did show in the ring. Last night Saturday June 17th 2017 on HBO PPV, Andre “S.O.G” Ward (32-0, 16 KO’s) defeated Sergey Kovalev (30-2-1, 26 KO’s) for the second time Via TKO in the 8th round. In what was a shocking turn of event, Ward turned the fight around and knocked Kovalev out with body shots. In the co-feature, Guillermo Rigondeaux (18-0, 12 KO’s) got a first round KO victory over the undefeated Moises Flores (25-1, 17 KO’s), on a very controversial call at the end of the first round. Both fighters seemed to fight past the bell of the opening round, and Rigondeaux ld anded a punch after the bell that knocked Flores out. The fight should have been called a no decision, but was instead called a KO victory for Rigondeaux. Dmitry Bivol (11-0, 9 KO’s) was also victorious over the gun shy Cedric Agnew (29-3, 15 KO’s), as he defeated him with a 4th round TKO. Ward VS Kovalev 2 started in similar fashion as their first fight. Kovalev was on the attack from the opening bell, and Ward was on his heels being very defensive, while trying to counter punch. Kovalev out landed Ward in all of the first 6 rounds except one, and it seemed like Ward was far behind on the scorecards again. Ward however did commit to the body of Kovalev, and it would end up paying dividends. Ward’s slick and effective body punching would soften up Kovalev’s mid section, and have him looking gassed by the 5th round. Kovalev was breathing heavy and losing steam, just like in their first meeting. Ward started coming alive in the second half of the fight, just as he he in the first fight. In the 7th round, he came right out with a huge right hand that hit Kovalev right on the money, and then continued with a sustained body attack. In a tight 7th round however, Sergey Kovalev seemed to be tiring some more, even though he was the aggressor for most of the round. In the 8th round, Kovalev seemed to start really being bothered by Andre Ward’s body punching mid way through the round. With about a minuted left in the 8th, Ward landed a spectacular straight right hand which really stunned Kovalev, and Ward would go on the attack with Sergey backing up. Kovalev, looking like he was about to keel over, got pinned against the ropes took 3 more hellacious uppercuts to the gut, and referee Tony Weeks stopped the fight. Kovalev simply looked as if he could no longer defend himself because of the sustained body punishment. Chad Dawson — Win, TKO 10th round (12), 9/8/12. Andre Ward — Loss, Unanimous Decision (12), 11/19/16. Will Andre Ward Be Victorious In Rematch With Kovalev? Next Saturday June 17th 2017, will be the rematch between Andre Ward (31-0, 15 KO’s) and Sergey Kovalev (30-1-1, 26 KO’s), which is poised to be one of the biggest fights in 2017. It is the battle for Light Heavyweight supremacy, with 4 titles on the line. Ward will defend the WBA/WBO/IBF/TheRing Light Heavyweight titles, which he took from Kovalev last November, in a very close decision victory. A lot of doubts were cast on Ward, and a lot of questions were raised about if he actually did beat Kovalev, in what was the narrowest decision in recent memory. Many fans, and of course Kovalev, did not agree with the decision, and so we have the rematch. So, is there any reason to think that Ward won’t be victorious this time around? Between the 2 fighters, only Kovalev has fought someone twice. He defeated Jean Pascal via TKO back in March of 2015, and then completely destroyed him in their rematch back in January of 2016. But was Kovalev better in the rematch? Or was Pascal just that much worse? Pascal was very gun shy in their second fight, and Kovalev took complete advantage of that fact. Never the less, it was a complete wipe out in their rematch. In my opinion, this would be the only evidence that could support a possible Kovalev victory. In the first fight with Ward, Kovalev knocked Ward down in the first round, but was unable to knock him out. He will have to do that to win, because going to the scorecards after 12 rounds with Ward, will most likely not be favorable for any fighter for that matter. Andre Ward on the other hand, has literally beaten everyone relevant in or around what ever weight class he has been in. In his Super Middleweight days, he went on a rampage. Ward was predicted to be one of the first eliminated from the Super 6 tournament. Guess what. He went on to win it. He defeated all the top fighters at Super Middleweight which included Mikkel Kessler, Sakio Bika, Arthur Abraham, and of course the great future hall of famer Carl Froch. He then went on the defeat the once feared Chad Dawson, to completely take over the division. Ward has made a career out of fighting and beating the best, so there is no reason to think otherwise here. If anything, he has learned from the first encounter with Kovalev, and will defeat him more decisively this time around. Kovalev needs a knockout to win here in my opinion, which is definitely not out of the question. If it does go to the score cards after 12 rounds though, look for another close decision, but Andre Ward will be victorious.